When you think Nordhavn, you probably think long-distance trawlers with paravanes, yachts that scoot along at 10 knots. Well, think again. The builder of Nordhavn Yachts went against type and came out with a new kind of high-end yacht, a sport fisher that eschews the Nordhavn exterior lines and will do 30 knots. Meet the new Toro 60, a fast, playful yacht that is so customizable, a fishing aficionado is sure to find a flavor he can’t live without. Inside, the Toro 60 has two things: lots of space and a high-quality finish that screams Nordhavn. The salon is flooded with natural light due to the acreage of windows that extend out in all directions, and there is no trace of a cramped interior overfilled with furniture or fixtures. The Toro salon has an L-shaped settee to port, a low cocktail table and another convertible sleeper settee to starboard, right by the sliding entry door. A freestanding table with four chairs create the dining room, across from which is cabinetry that houses a popup TV, refrigeration, a bottle cooler and the main distribution panel. The color scheme is all white and beige, which creates a very neutral palette in a contemporary, no-nonsense interior that, shows off the fine finish of the Maobi wood furniture and accents. She has a two-cabin, two-head layout. The master suite is in the bow with a center island bed, lots of storage options, a nice head and a shower compartment with a frameless shower door. Guest accommodations include a cabin with over/under bunks and a second head that will also serve day guests. The Toro has a U-shaped galley-down arrangement. The Sub-Zero refrigerator doors are finished in varnished Maobi wood, which offset the white Corian countertops nicely. A freezer, ice-maker, and a Miele cook top and microwave complete the rest of the appliances. Storage is excellent with overhead lockers. The steps up from the cockpit to the flybridge are well built and placed, which means anyone unsteady on his feet or carrying anything up top should have an easy time of it. Here, the hardtop extends over both the helm and the socializing area, which is just forward. The overhead can stand alone, but it makes a nice starting point to create a full enclosure. The twin CAT 1,136 hp diesels power the Toro 60. At a 15-knot cruise, she has a minimum 450-mile range, burning about 23 gph. Top speed is 30.2 knots, at which point the CATs burn a combined 59 gph. Take the speed down to 9.2 knots, about 950 rpm, and fuel burn is just 4 gph. United Yacht Sales New Jersey would love to guide you through a personal showing of this 60' Toro 60 2012. 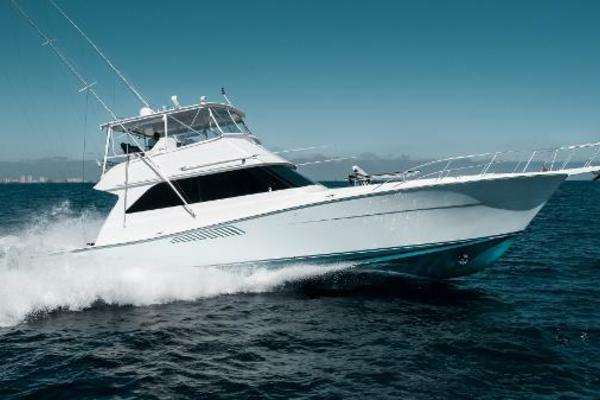 This yacht for sale is located in Dana Point, California and priced at $1,395,000. For a showing please contact us by filling out the form on this page and we will get back to you shortly!